Yesterday run consisted of a 1/2 mile warmup + 3 speedy miles + 1/2 mile cool down + stretching. I’m doing 400s with a 10 second walking break in between each interval and then a 1:30 minute walking break after every set of 4 x 400. I’m really intimidated by the Yasso 800s, but I am sure I will mix them in soon. 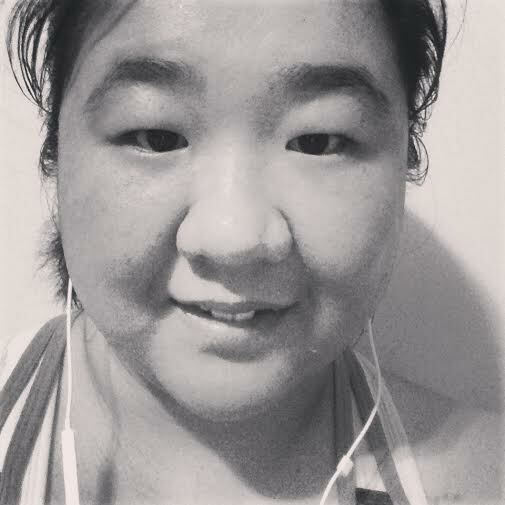 I had to make my post-run selfie black and white because I was actually sweating so much in the original it was just too gross to post. (The black and white filter makes it look like I’m not sweating at all?!). I guess I could just not post one but what kind of running blogger would I be if I did that? Look at that messy, sweaty hair! Isn’t it just beautiful? #HairModel (also #EyebrowModel). You’d be sweaty too if you lived in Florida. This morning at 10am my car was showing that it was 81* out! Last week I listened to “My Howntown” by Bowling for Soup to get me pumped up for speeeeeeeeed. My song for yesterday’s speed workout was “Riot Girl” by Good Charlotte. I think you can see a trend here: Bad Music Kristina Listened To a Decade Ago and Still Hasn’t Gotten Over. I’m finding that doing speedwork after a long day of work is oddly satisfying. I thought it would be extra tiring … and it is, but it’s also energizing. I think you know what I mean? I”m mostly just tired because the office is VERY busy. Ever have one of those weeks where it’s Wed. and you really wish it was Fri. but you’re so busy that you actually need it to go back to Mon.? That’s where I’m at. I’m looking forward to Christmas break (my office closes the week between Christmas and News Year’s). I just have to keep ploughing ahead until we get there! It’s such a simple thing but I whenever I get to run mid-day I always have a really good day! I’m not exhausted from having to get up at 5am for an early morning run and I’m not exhausted because I’m running at the end of the day after work. Are you taking any time off at the end of the year? – I am in the mood to bake something but I’m not sure what! Did you run at a track for your 400s? I think I may get on the treadmill today and do some intervals. I need to start adding speedwork back to my routine, but I haven’t been to the gym in so long I’m scared to go! I did them on the treadmill. I knew that transition was going to make it seem like I did them outside… that was lazy writing, oops! great work! You’re bound to PR your next race if you keep it up. You body is thanking you for teaching it how to clear lactic acid. Ali K. I do not have access to a track and I run on a linear trail. I use a “time” metric to give me a good guess at distance during interval work, well that and my coach programs me for time based intervals, not distance. This is usually programmed during a 7 – 8 mile run. You can modify it for shorter distances by dropping the warmup to 5 minutes and doing 2 sets of intervals. Anything to get your pace changing during the workout at least two times a week. I think after the workout my body was mostly just thanking me for sitting down on the ground for a few mins 🙂 But I am sure you are right – in the long run it will thank me for the hard runs! Also, thanks for sharing your timed interval workout. I may try that! Great work Kristina! Crazy hard at the time but worth it when you’re finished yeah? (Worth it when you PR too!). I too have not attempted those Yasso 800s yet – read a brief description of them, which both intimated and confused me a lot, so haven’t gone back to figure them out or try them out yet. Let me know if you do, oh and if you can explain them better to me! From what I understand with 800s you run half a mile FAST and then take a short recovery walking/light jogging break of about 2 minutes and then repeat. Supposedly what you run your 800 in will be a predictor of your marathon pace. For example if you run it in 2mins 45secs then you should be able to run a marathon in 2hrs 45mins. I think people are about 50/50 on whether the 800s really accurately predict your marathon pace, but supposedly it comes pretty close for most people.